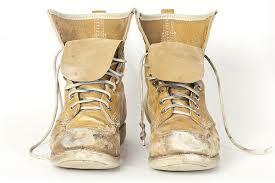 Disparate Data Points: Entrepreneurship Exploding or Dying? An explosion of young companies that are bootstrapped, or financed outside of traditional venture capital (i.e., Silicon Valley) or traditional bank financing, is what I see every day. I see many companies finding their way to a point of lift-off, stability, and medium-sized revenue and profit without ever raising traditional financing. These companies are therefore more independent and able to plot their future with more flexibility. Having gotten to this place, they treasure flexibility to pursue business strategies of their own choosing. By all means, they should strive to maintain that flexibility and I hope my investment fund, Greybull Stewardship, is a vehicle for them to do that. Entrepreneurship education and role models are available. More education and training of entrepreneurs exist in the world today as more schools offer entrepreneurship courses. Also, more books, conferences, and advisers are available to aspiring entrepreneurs. Growth of angel investing. The growth of Angel List and of many angel investing communities around the United States demonstrates how this has become a common financing tool for young firms. There are many more books and other forms of education for angel investors that are helping standardize how this is done. I see quality companies everyday that have had some help from angel financing and have grown well beyond that stage. Angels tend to be a bit more forgiving than professional investors, and that helps get companies off the ground. Companies cost less to start. From simple productivity tools to inexpensive servers, storage, and bandwidth, to the ability to build software overseas, to the ability to avoid office space and have a virtual company, many of the costs of creating companies seem to have declined. Internet scale. The Internet is enabling younger companies to reach larger markets enabling them to grow and to achieve some level of stability. JOBS Act. While it has not changed things dramatically yet, this legislation signals society’s interest in helping young companies get going and broaden the sources of financing available. Peer to peer lending. Lending Club, Prosper, and even On Deck, all seem to be creating more options for smaller or younger companies to find financing. Enterpreneurship is part of popular culture. Maybe because consumer Internet companies play such a large role in so many lives today, popular culture is influenced by the explosive growth and creative services developed by Internet companies. 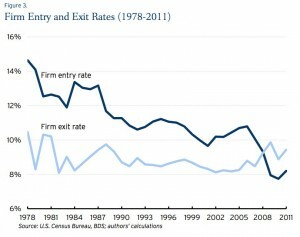 At the same time, there is data to suggest the dynamism of the American economy, including entrepreneurship, has been declining since the 1970’s. In a study by Ian Hathaway of Ennsyte Economics and Robert Litan of the Brookings Institute, they explore the decline of “dynamism” in the US economy. This chart shows that firms that are less than one year old are a declining percentage of the overall total, suggesting that the churn of business in America is declining. This decline is difficult for me to reconcile with what I see every day. I suppose it could be that the absolute number of young companies reaching lift-off point is increasing, while it is still a declining percentage of the whole. It is also may be that the companies that survive are living longer and the overall base has gotten so large that there is an inevitable decline of start-ups compared to the whole. Or, it may be that micro businesses like restaurants and dry cleaners are no longer being started as they once were (not sure this is a bad thing) as those businesses are historically very difficult. 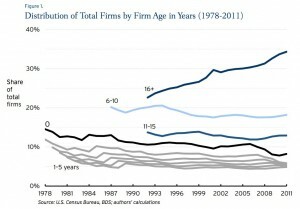 Another chart from this study shows the distribution of total firms by age.